The Booyah Vibra-FLX spinnerbait is built from Vibra-FLX wire, which creates more vibration than standard stainless wire. This wire also offers flexible memory which means it will stay tuned after several catches. 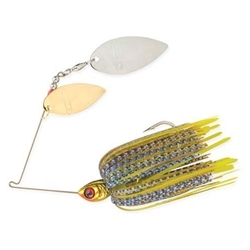 This 3/8oz spinnerbait comes equipped with counter-rotating blades and a new Silo-Tek skirt which makes it much more durable.